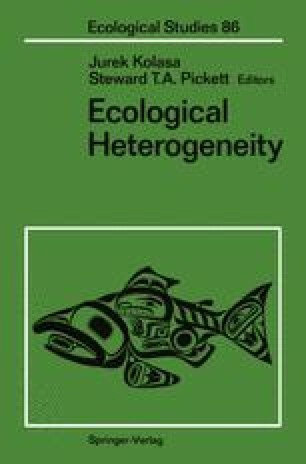 Benthic and pelagic marine habitats, like terrestrial landscapes, can be viewed as mosaics of environmental quality produced by spatial and temporal variation in the physical and biological constraints encountered by populations. In marine systems hydrodynamic processes (water column stability, temperature and nutrient gradients, turbulent oceanographic features, storm disturbances) and biological processes (competition, grazing, predation) affect the recruitment and survival of populations. The emerging view of the dynamics of communities and populations as nonequilibrium systems (Chesson and Case, 1986; DeAngelis and Waterhouse, 1987) increases the interest in processes that generate or perpetuate heterogeneity. That variable environmental parameters cause gradients in community structure or the distribution of species is by no means a novel observation. Merriam’s (1898) concept of life zones relating plant distributions to changes in air temperature along an elevation gradient was an early explanation of environmentally controlled community patterns. Terrestrial biomes (Clements and Shelford, 1939) are defined by large-scale changes in physical and biological characteristics of the landscape. In some marine habitats, however, these divisions may be less apparent, but they are nevertheless similarly heterogeneous over many scales in space and time.